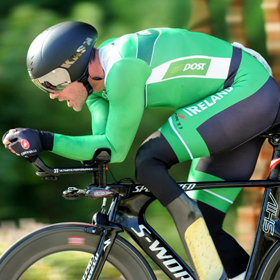 My name is Colin Lynch, and I’m a Paracyclist with the Irish Elite Paracycling team. When I was 16 years old I broke my leg playing rugby and at the same time discovered I had a spinal cord tumor. There were complications with my broken leg; multiple infections and six years of surgeries to try and fix the problem before I was finally told they would have to amputate my leg below the knee or risk ending up in a wheelchair for life. It was the hardest decision I’ve ever had to make. The surgery went well and it wasn’t long before I was able to return to activities and sports I hadn’t been able to do for years. My involvement with Paracycling began In 2008 when I was watching the Paralympic Games on TV and saw Elite Paracycling for the first time. I knew straight away it’s what I wanted to do and got to training shortly afterwards.